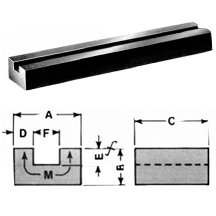 MCA08606 AlNiCo Channel Bar Magnet,A:1.500"; B:0.875"; C:6"; D:0.500"; E:0.312"; F:0.500"
A:1.500"; B:0.875"; C:6"; D:0.500"; E:0.312"; F:0.500"
The MCA08606 AlNiCo Channel Bar Magnet is made from high performance AlNiCo 8. The dimension also can be customrized. 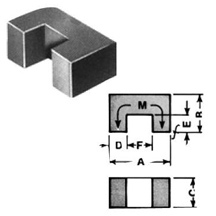 Dimension: A:0.500"; B:0.312"; C:5"; D:0.156"; E:0.125"; F:0.187"
Dimension: A:0.750"; B:0.500"; C:6"; D:0.187"; E:0.125"; F:0.250"
Dimension: A:1.250"; B:0.750"; C:6"; D:0.406"; E:0.250"; F:0.437"